With a growing call for an increased emphasis on computing in school curricula, there is a need to make computing accessible to a diversity of learners. One potential approach is to extend the use of physical toolkits, which have been found to encourage collaboration, sustained engagement and effective learning in classrooms in general. However, little is known as to whether and how these benefits can be leveraged in special needs schools, where learners have a spectrum of distinct cognitive and social needs. Here, we investigate how introducing a physical toolkit can support learning about computing concepts for special education needs (SEN) students in their classroom. By tracing how the students’ interactions—both with the physical toolkit and with each other—unfolded over time, we demonstrate how the design of both the form factor and the learning tasks embedded in a physical toolkit contribute to collaboration, comprehension and engagement when learning in mixed SEN classrooms. Zuzanna Lechelt, Yvonne Rogers, Nicola Yuill, Lena Nagl, Grazia Ragone, Nicolai Marquardt (2018). Inclusive Computing in Special Needs Classrooms: Designing for All. In Proceedings of ACM CHI 2018. ACM Press. Learning about computing technology has become an increasingly important part of the school curriculum but it remains unclear how best to teach it to children. 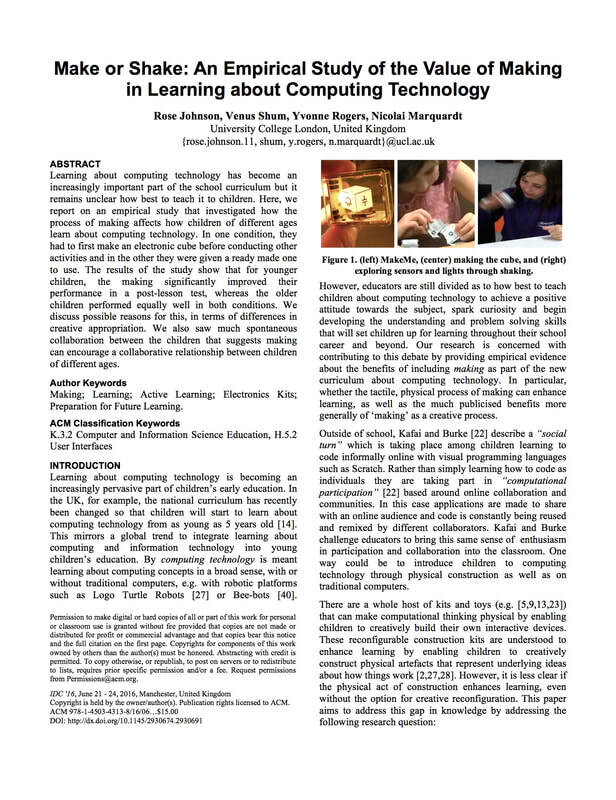 Here, we report on an empirical study that investigated how the process of making affects how children of different ages learn about computing technology. In one condition, they had to first make an electronic cube before conducting other activities and in the other they were given a ready made one to use. The results of the study show that for younger children, the making significantly improved their performance in a post-lesson test, whereas the older children performed equally well in both conditions. We discuss possible reasons for this, in terms of differences in creative appropriation. We also saw much spontaneous collaboration between the children that suggests making can encourage a collaborative relationship between children of different ages. "[...] Out of this collaborative process, the MakeMe cube was born. It was presented as a simple flat-pack construction kit, comprising six pieces, intended for assembly into a cube. When shaken, it would change color depending on the speed and the direction of the shaking motion. The ultimate challenge was to shake the cube into a multicolored light show. Each piece made up a side of the cube; one side had a PCB embedded in it, another an accelerometer, another a battery, and another an LED. The other two sides were left blank. The idea was that by first snapping the pieces out and then working out how to put them together to make the cube, children would learn about the properties of each component and the mapping between sensors and actuators [...]"
The emerging Internet of Things (IoT), through which vast amounts of everyday objects are becoming embedded with computing and networking capabilities, is rapidly changing the way society uses and experiences technology. Despite this, children do not systematically learn about IoT in schools. 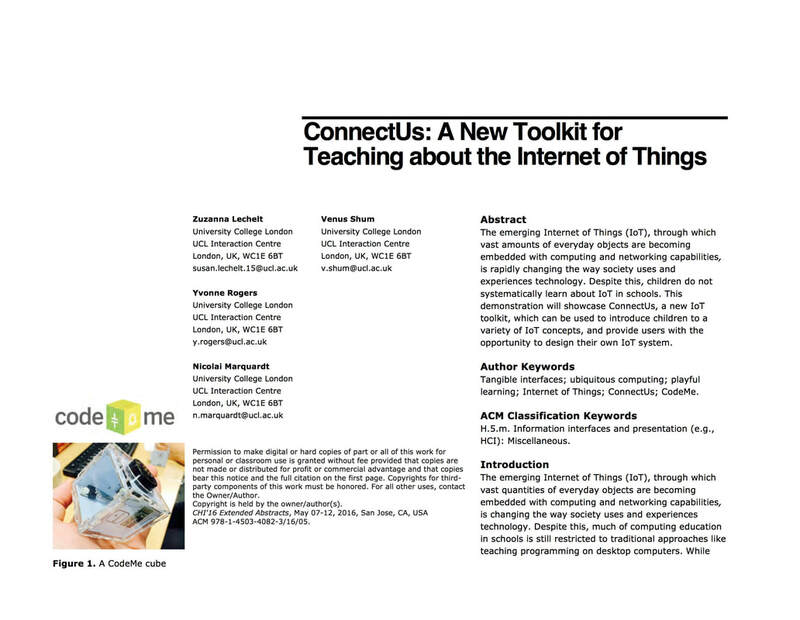 This demonstration will showcase ConnectUs, a new IoT toolkit, which can be used to introduce children to a variety of IoT concepts, and provide users with the opportunity to design their own IoT system. The emerging Internet of Things (IoT), through which billions of everyday objects are becoming embedded with the abilities to sense their environment, compute data, and wirelessly connect to other devices, has been widely recognized as the new disruptive technology of our time. 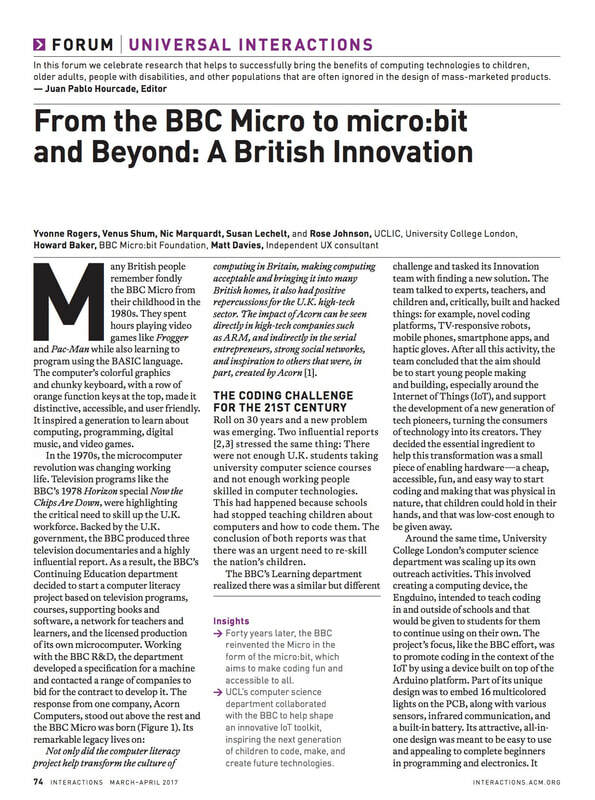 The predicted ubiquity of connected devices indicates that IoT technologies are quickly becoming an important part of the digital fluency curriculum, however, no research yet exists on suitable pedagogical approaches for teaching children about the IoT. 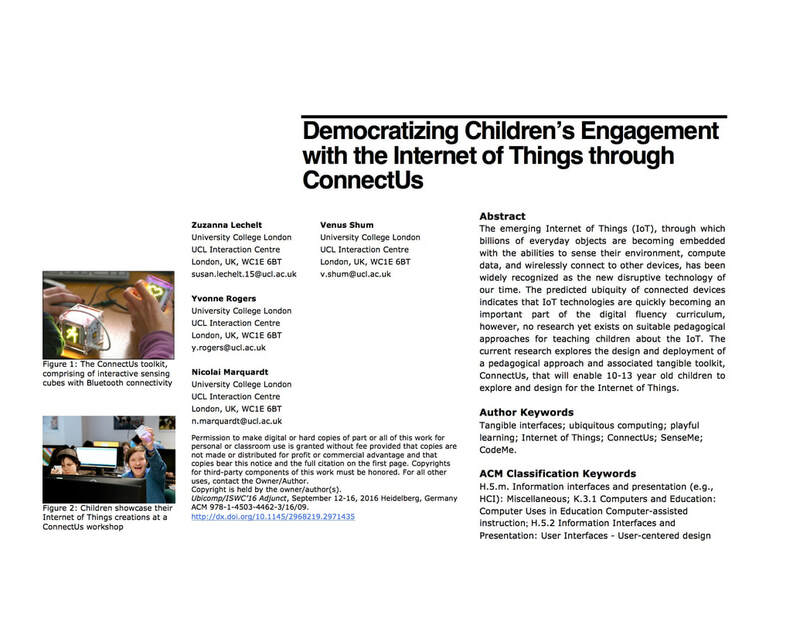 The current research explores the design and deployment of a pedagogical approach and associated tangible toolkit, ConnectUs, that will enable 10-13 year old children to explore and design for the Internet of Things.